The public cares little about how long Olympians train or how many practices football teams suffer before playing a game; the public cares about gold medals and victories. Big wins define success. Many successful companies grew by the hand of all-nighters and sweat, others by beer and four-day work weeks. What matters at the end of the day is attitude, strategy and inspiration. With a team on the same page and in good mental health, the engine can plow forward full steam ahead. Through calculated innovation and disruption, an organization can leapfrog the competition overnight. If everyone believes in what they are doing and work hard to make a difference, anything is possible. Long work days are symptomatic of success and passion – hardly ever the source. Man hours do not scale an organization – that’s industrial era nonsense. Asking your people to work longer days will not shovel fresh coal into the fire. The message should be: care more. If your team does not inherently care a lot, then find different ways to get them charged. Set the vision. Plaster a mission statement to the wall. Whatever it takes to remind everyone why they wake up everyday and come together. Charles Swindoll said, “Life is 10% what happens to you and 90% how you react to it.” It’s all about attitude and what you take personally. If you don’t let things bother you, life rolls on pretty pain-free. I do not promote ignorance, however, so people with an inherent “whatever” attitude disappoint me with how disconnected they are from the people and issues around them. You need to care – often care a lot – to make a difference in this world. It takes the balance of a monk and the stamina of an olympian to put your heart everywhere and nowhere at the same time. It’s exhausting and you need to make sure you stay in good shape to keep the balance alive. My brother said it well: “If you don’t have the energy to be positive, it’s impossible to be positive – your health is your first priority.” Your reaction to life depends solely on your frame of mind. If you are mentally or physically beat to hell, it’s pretty difficult to muster a positive reaction to anything. Make a point to sleep well, eat well and take real breaks. Take care of yourself. With a healthy mind, you can meet life with a healthy attitude and virtuous reactions. Otherwise, you will foster an exponential geyser of negativity that will only drag you down and keep making life worse. Every January, my parents do a brilliant thing: they map out the year’s birthdays, buy cards for everyone in a single trip (often armed with coupons to save big bucks), sign & address every card in a single sitting, and slip them into the mail one by one as each birthday approaches. They save dozens of trips to the store (as much as 35 hours per year in round trips!) and finish the project with an annual peace of mind. It might sound like cheating, but how many people’s birthdays have you missed? When faced with impending birthdays, it’s a lot of work to go to the store every time – the deed rarely gets done! Better to do it in a batch than not at all. Batching like-minded tasks plays a key role in productivity. While multi-tasking, priorities get disheveled. You only carry out part of a task before moving on to another. By the end of the day, you’ve touched hundreds of things and finished nothing. Better to finish one stack and move on after it’s done. You may not make progress in other areas, but at least you can take pride in crossing something off your list. The “like-minded” part is important. Managing money uses a different part of your brain than design. It takes a lot of mental effort to switch gears between creativity and cold numbers. The transition between may cost you time and quality. While the financials and design may fall under one project, they are not like-minded processes. Better to do the financials for three different projects at once – even at the expense of crossing a project off your list. You will hone your focus and build mental momentum to get you through similar tasks much quicker. In aggregate, you will save a lot of time and yield better results. Study your to-do list. Group similar items by tool used, skill needed, energy level, people involved or any other comparison metric. Split tasks into sub-tasks if they need more than one different thought process. Tackle the biggest group pile of like-minded processes first. Then revel in your accomplishments. Spurts of energy and productivity are rare – whatever you do, do not waste them. Don’t stop until you drop. This may be antithetical to my advice on health and rest, but sleep is far more accessible than inspiration. You can always sleep; you cannot always break the personal sound barrier. When I was 13 years old, I realized the popular kids were not always happy – they just looked really happy when they were busy hanging out with friends (which was often, but not always). When they went home and found themselves alone, they suffered the same withdrawal that I did when they thought too hard about it (some hyper-social kids are never comfortable alone and have worse withdrawals than anyone else). We find ourselves at our lowest points at home left alone with nothing but our thoughts. In rough patches, these lulls sap our energy, optimism, and confidence. Loneliness cripples us. The popular kids taught me early on that staying busy and surrounding yourself with good people dramatically increases your positive energy and quality of life. Like a shark, you are happier if you keep moving. Stay active, keep friends close, and only stop to reflect if you dare. Before long, you might even become the popular kid. How often do you find inspiration? Once a day? Once a week? How often do you experience epiphanies, the moments in life when your heart swells and your mind races? Inspiration is sacred and rare. Never let it go to waste. Act on it immediately. Do the work, get dirty. Procrastinate other things if you need to. 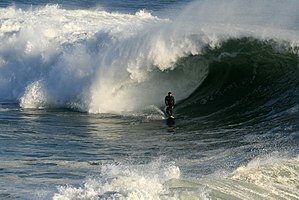 Ride the wave until the wave breaks or until you are too tired to ride anymore. If you truly believe in what you discovered, other people will eventually understand.